National Geographic Children's Books, 9781426306266, 32pp. You’re two inches away from a poison dart frog. You’re lying on the rain forest floor as she hops toward you, utterly fearless. This deadly terribilis frog has nothing to fear; your fear is that any accidental contact with your skin could mean death! 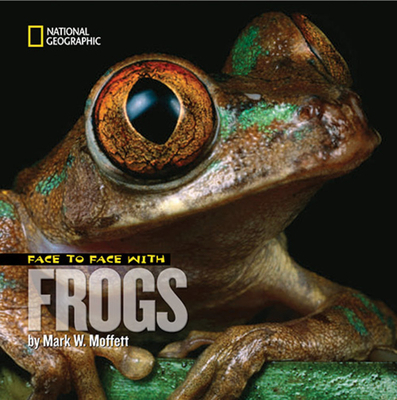 Let Mark Moffett give you the expert view on our amphibian friends, from metamorphosis to diet, from habitat to distinctive features; and learn why we urgently need to foster a healthier planet for these sensitive creatures. Mark Moffett is an ecologist, a photographer, and an author; but above all, he’s an adventurer. He's not just an expert on the rain forest canopy–he was also the first to climb the world's tallest tree. Mark didn't just stroll to the stage at the Explorers Club to accept the prestigious 2006 Lowell Thomas Medal for Exploration—he descended by rope from the 80-foot ceiling. Known as "Doctor Bugs," he has photographed, studied, and investigated ants, spiders, and frogs. Mark is fascinated by invertebrates. The Boston Globe describes his book The High Frontier: Exploring the Tropical Rainforest Canopy as "a stunning mix of adventure, nature photography, and hard scientific inquiry that ranks with the best work of Jacques Cousteau."